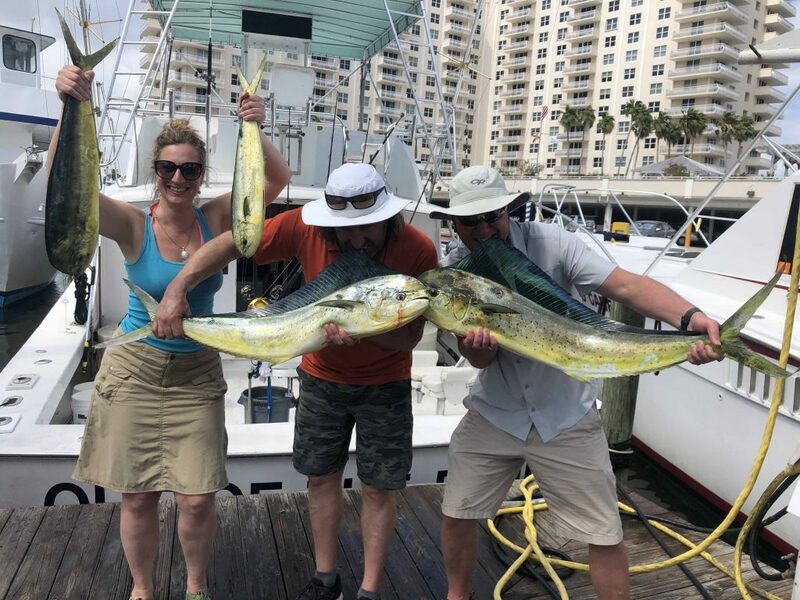 Nice Mahi-Mahi catch on our deep sea fishing charter. I love fishing the summer months in Fort Lauderdale. The action is off-the-scale. 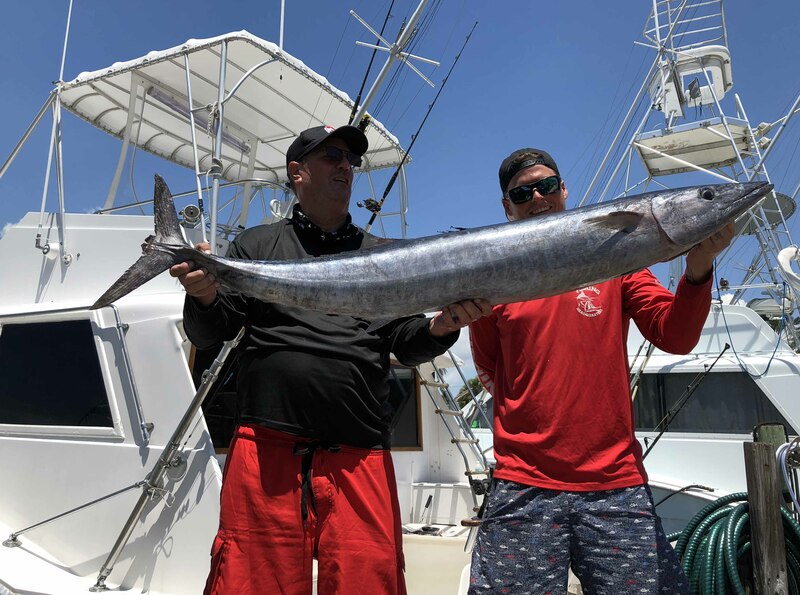 Tons of action on the reef catching bonitos, kingfish, blackfin tunas, barracuda, wahoo and more. The seas are generally super calm which makes for very comfortable fishing conditions. The only drawback to summer is the heat. Fortunately, all our boats have an inside, air-conditioned cabin so that you can escape the heat for a few minutes and recharge in the cool cabin. With the beautiful weather, we’ve been fishing every day on 3 trips daily. Our morning trips are doing pretty good, but our afternoon and night trips are slamming the fish. The better afternoon bite may be due to the passing showers that usually pop up around 2-3pm. When the storms come through, the barometer drops and the fish seem to turn on strong. Fish really like the low pressure just before the storm hits. Anyway, the afternoon bite has been really good. 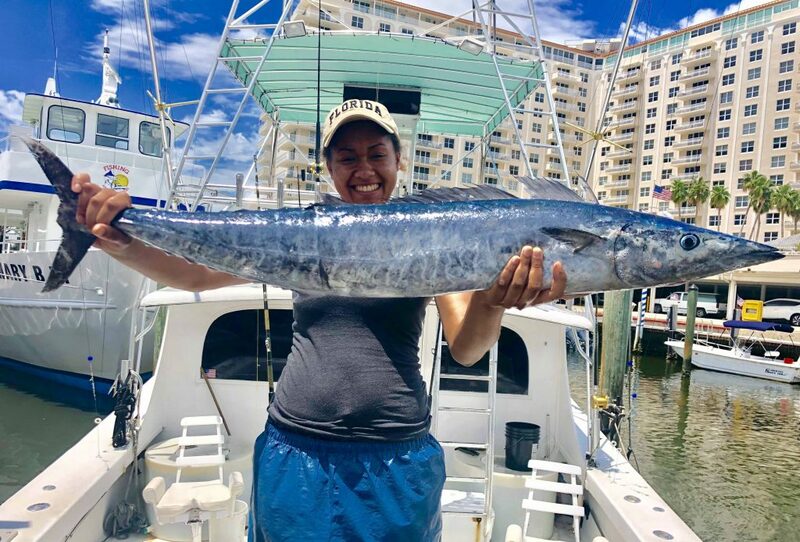 Nice wahoo caught on our sportfish charter in Fort Lauderdale. Night fishing is quite good this time of year too. Snappers of all species are biting on our night anchor and chum trips. We’ve been catching yellowtail snappers, mangrove snappers and some mutton snappers as well as some groupers too. Snappers spawn during the summer months, when the water is warm and the tides are moderate. They amass in large numbers of fish to spawn and when they are spawning, they become very aggressive feeders. 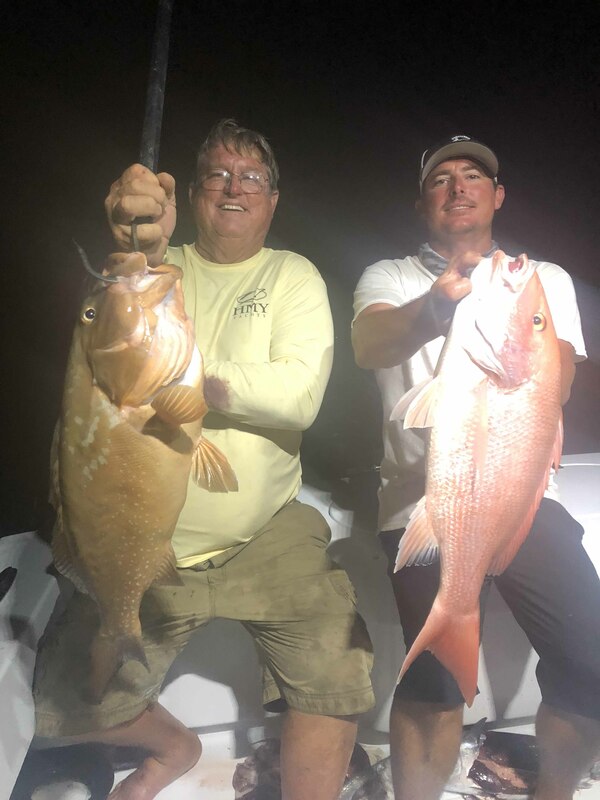 This behavior usually lasts from June through September so we have quite a bit of time left of the really good night snapper fishing trips. Nice snapper and grouper caught on our night anchor fishing trip. Daytime fishing has been hot too, and I don’t just mean the weather. On our sportfishing charters, trolling is red hot for kingfish, blackfin tuna, bonitos, barracuda, wahoo, mahi-mahi and even a rare sailfish. With the fish as bunched up as they are on the reef, trolling is the most effective way to catch a lot of fish, and good variety too. You can literally catch just about anything trolling the Ft Lauderdale reefs. The biggest fish biting these days is wahoo. There are a lot more bonitos and kingfish around the reefs, and they are very aggressive feeders, so we catch a majority of them. But every once in a while, when you least expect it, a wahoo jumps on the line. You’ll know that this is happening when the reel starts sceaming drag off and the captains starts jumping up and down screaming, “wahoo, wahoo!!”. Haha, it’s a lot of fun when that happens. In the summer, many of the fish go deep, to get down to the lower, cooler water columns. We use planers to get the baits down to those depths where the fish are. The planer baits get most of the action when we’re trolling. These deep baits get all the bonitos, kingfish and wahoo that we catch. The other baits we pull are surface lures. While these baits don’t get the same level of action as our deep baits get, they sometimes get the mahi-mahi or the sailfish or the big tuna of the day. Even though it is warmer water near the surface, predator fish know that the small baitfish try to escape their fate by getting up to the surface of the water to create commotion and confuse the predator. Sailfish and mahi excel at catching these escaping fish on the surface, so more often than not, when the surface line gets a bite, it’s going to be one of these really sought after fish. You never know what’s going to bite out there. On our drift fishing trips, pretty slammer action as well. Morning fishing has been decent but not great. Action on snappers is decent and sometimes there are some big king mackerels that bite in the mornings early. We’ve been catching a lot more in the afternoons. For some reason, and maybe its just because the fish are sleeping in, the afternoon fishing has been excellent and far and away the best trip of the day. Snapper and grouper action in the afternoon has been far superior and although not as many kingfish bite late in the day as in the early mornings, there are still a few kings to be found later in the day. 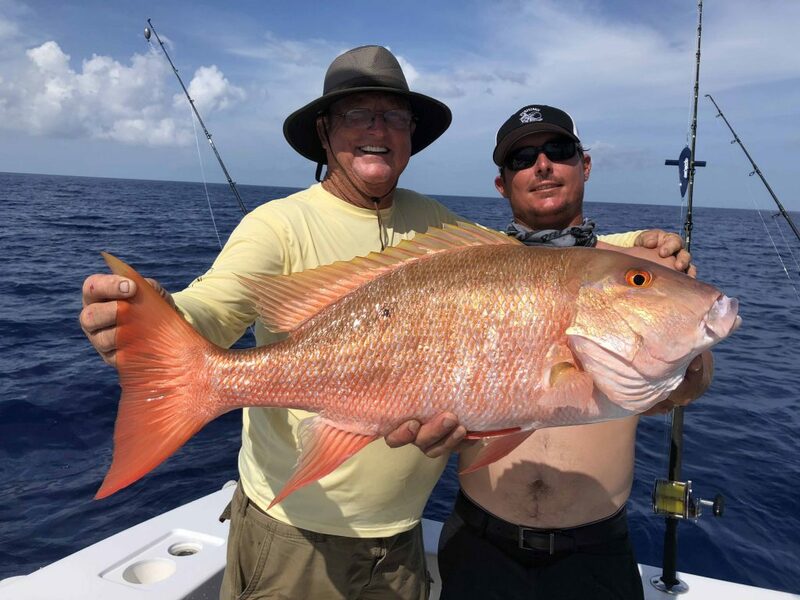 The largest of the snappers that we catch consistently, mutton snappers, are biting extraordinarily good in the afternoons. I’ve been seeing some 10-20 pounders caught lately and good numbers too. It’s been one helluva summer for mutton snappers this year. 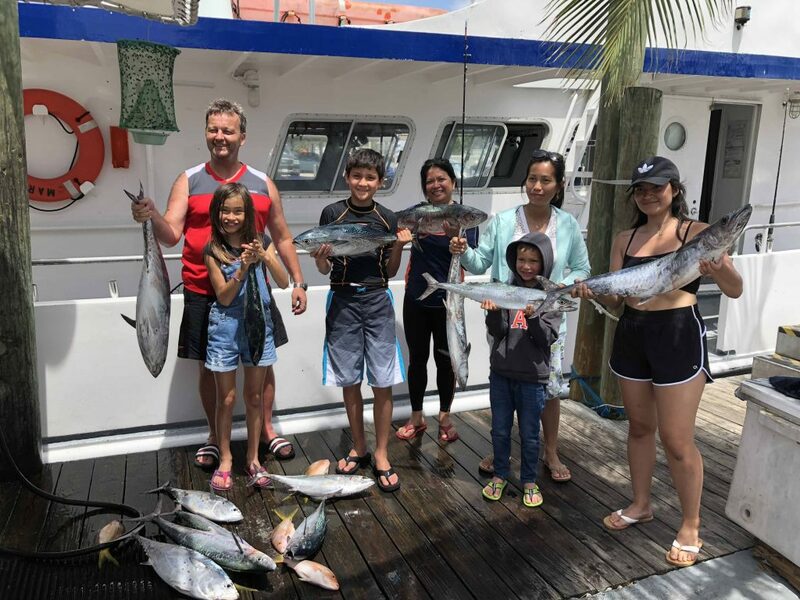 Nice catch by this family while fishing on our drift boat fishing trip.